Otaru is the loveliest little oceanside town, and I’ve already been down there about four times… and in August, my boyfriend and I took a daytrip to the Otaru Aquarium! First, we took a JR train straight to Otaru station, and even though there weren’t any seats left, we still got to enjoy the view of the countryside and the sea. Afterwards, we waited for a bus that would take us up the hill to the aquarium. It was a pretty warm day so we grabbed bought some cold & sugary drinks (blue Hawaii hehe) from a nearby vending machine. Once we arrived, we got our tickets and then went inside to explore. We got to see all kinds of sea creatures, and I especially appreciated the jellyfish, the red octopus, and the tiny conger eels. Also, if you go sometime, don’t forget to check out the balloon lumpfishes (フウセンウオ) because they’re too cute to miss. Next, we had lunch in the cafeteria and we both bought a sort of omelette curry that was shaped like a turtle :P (it was called カメの太郎くんランチ). Whether you are 5 years old or 30, I think everyone can enjoy a plate of turtle-shaped curry. After finishing up lunch, we went to see what marine animal shows were going on. We saw every one of them- dolphins, penguins, seals – but I have to say that the walruses’ performance could not be beat. The trainers would say “aisatsu!” and they would wave their fins at the audience. And they’d say “hazukashii!” and they cover up their walrus faces like they’re embarrassed—soooo adorable. I wish I had filmed it actually, looking back. Maybe I’ll have to go again. Continuing on, next door to the aquarium was a mini amusement park which included a ferris wheel! Being on a cutesy date and all, naturally, we had to ride it. From the tip top we took a bunch of photos of the view. It was so beautiful, almost like a backdrop from a Ghibli movie (see below~). Finally, we decided rather than taking the bus again, we’d ride the ferry back to central Otaru. We barely caught the last boat, and had to run down the port to board in time. This ferry ride was quite relaxing and the heat wasn’t so bad thanks to the sea breeze. We also got a glimpse of one of Japan Coast Guard’s ships which was pretty cool! We wandered around the streets of Otaru a bit before going home. I always stop by the オルゴール堂 so we went there and tested out some music boxes and stared at creepy antique dolls for a bit. For dinner, we couldn’t really decide on a place in Otaru so we just went home and ate Kimchi Soondubu at Sapporo Station! For the first time in all of my dozens of years on this earth, I’m the queen of my own castle. I am now living solo. It is almost 7 months since I arrived in Sapporo. And today, I have listed 7 things I learned about living alone and as an expat in Japan. Convenience stores in Japan are awesome. Since I live alone, I find it a waste of time to cook for one. I usually get myself a meal on my way home from conveniene store. You can find almost anything there, and they're always clean, well serviced, and safe. When I'm not eating conbini food -- I get out and treat myself to a nice Japanese restaurant. I like ramen, okonomiyaki, takoyaki, udon, soba, ebi tempura and the list could go on and on. I like Japanese food very much. Japanese food is great. It's healthy, tastes great, and is fun to eat. Though tons of choices, I was overwhelmed when I arrived how expensive it is to eat out in Japan. Sapporo is not safe, it is ridiculously safe. No guns. No drugs. There are some bad gangster folks downtown but there is not very much violent crime. One thing that I have never seen anywhere else is that people in restaurants leave their wallets and expensive smartphones on the table when they go to the bathroom. And they would go together, so nobody in the party would be there to guard them and their money and expensive electronics would be out in the open unguarded. Coming from a third world country -- I've never come across such great confidence in strangers! Probably the easiest way to get yourself over to Japan is by getting yourself a teaching job there. Luckily, there always seems to be an abundance of positions available, because Japan always wants to learn more English. For some people, the job market isn't so hot in their home country, so getting a teaching job in Japan can seem like an attractive option. It is all about your connections. Once you have a base of contacts and a group of friends you can relax. When people first arrive they typically befriend other expats or people who want to practice English, but making an inroad with the locals is the only way you are going to develop a strong work and social network. It is a bit of a struggle at first. Its subway and train systems are crazy convenient, accurate, and make getting around the city so much easier. But taking taxi is a absoulutely expensive. Once, I was out late at night, I had no choice but to take a taxi. A less than 15-minute drive cost me almost 2000 Yen. I swore not take taxi again. Being polite doesn’t mean it must be fake or unnatural, it can be more of a lifestyle. Japanese people are friendly and polite, at least the the middle-aged generation. Old people may be curious about your background but might not know how to interact with you. Young people keep to themselves on their smartphones and electronics, as I'm sure most are in any country. People here are always ready to help you even though there would be a language barrier. The Japanese are very friendly, and incredibly welcoming and I was so pleased to confirm this for myself! It's a very different world, and a country that I highly recommend to my friends to visit someday. Honestly, I’m spoiled now. The welcoming feeling of a warm, toasty seat during your private time makes going to the bathroom in Japan a surprisingly enjoyable experience. Who knew you could have so many buttons when in the Philippines we just have a flushing option! It has been a little bit more than one year since I left Brazil to study somewhere else. In this case, Japan. However, due to my summer vacations, I went back home for a month. When going back home, I got to say I had mixed feelings. What to expect from a routine that is not mine anymore? Especially when I arrived and everybody else was doing something else. That was due to the inconvenience of vacation times that do not coincide. Despite, I arrived in my city in the best possible moment to travel there. There's a festival every August that colors the city as the clothing of traditional dancer hats. When I was younger I did not care that much about this festival, to be fair. 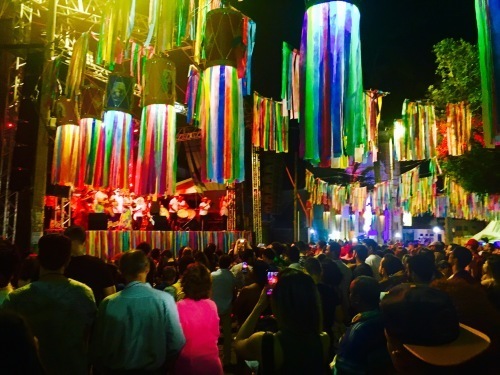 But ever since I started high school, and my school was in the very centre of this festival, I started looking forward to this time of the year. This is my first experience as an expat. Even though I had some short-term experiences abroad, so far, this is a totally new (and amazing) experience I'm having in Japan. And because now I have this new viewpoint, I was a tourist in my own hometown. Unbelievable, right? Of course, it is great to see family, old friends, classmates and the such, but it is as my heart is not completely there anymore. Some would say that your heart/soul is split and each little piece of it will remain in the places you went and had good experiences. A part of me is still there. But a part of me also feels I do not quite belong there anymore, maybe that I never belonged so well, maybe that I will never belong completely. Or maybe it is just an impression that I had while traveling half-way through the world to come back to Japan. Below, there's a photo I took from the August festival. Hope you like it! I was lucky to arrive in Sapporo on the 25th of September 2017, which was early autumn so the scenery was fantastic. The green leaves started to turn yellow, the weather was really nice, and the temperature was perfect, around 17 degrees. My friends and I decided that every week we’re going to have a new adventure, go to new places and travel around Sapporo, after that, Hokkaido. The first place that we decided to visit is the Susukino area. 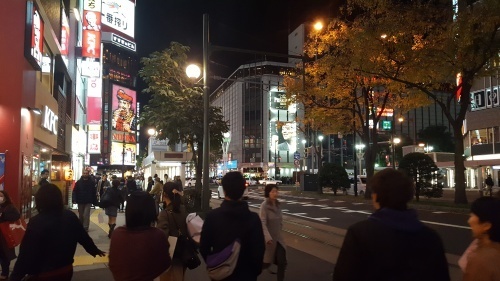 It was a beautiful Sunday night, we met up at Sapporo station, and since everyone was hungry, we went to a curry restaurant. 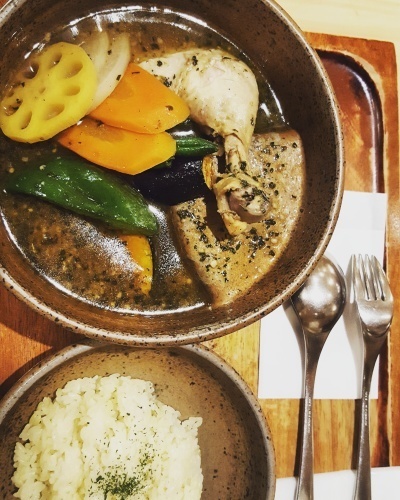 That was the first time I had soup curry here in Japan. We have curry in my home country (Vietnam), but the flavor is much different. Vietnamese curry uses a variety of spices, but the main ingredients that we use are only chicken and sweet potato, while the soup curry here has a mix of different vegetables, which I really love. After dinner we headed to a small, cozy bar. Unfortunately, I’m not 20 yet so all I could drink was Soda and water. I don’t remember the name of the bar, but I friends said they have some of the best drinks they’ve ever had. 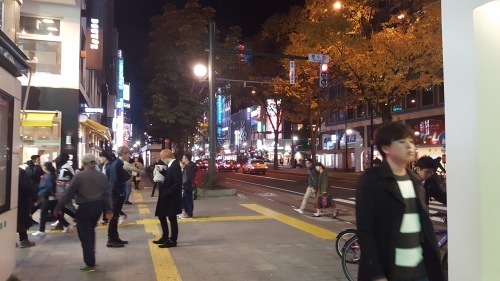 The southern part of Sapporo at night really reminds me of Ho Chi Minh city ( my hometown). All the crowded streets, the flashing lights seem to bring the city to life. We went for a walk after leaving the bar. Although it was quite late, we decided to go to a nearby karaoke. I love singing (although I’m not really good at it). We sang for 2 hours, mostly English songs. I tried to sing a Japanese song called “なんでもないや” from the movie “君の名は“, it’s my most favorite song. I miss my family back in Vietnam but I don’t feel homesick because I’ve made friends with really nice people from Sapporo, and although I have only been here for 1 month, I think I’ve already fell in love with this amazing city.